During the winter month’s cozy crockpot and slow cooker meals are a favorite in my kitchen. The meal cooks low and slow all day filling the house with mouth-watering smells. 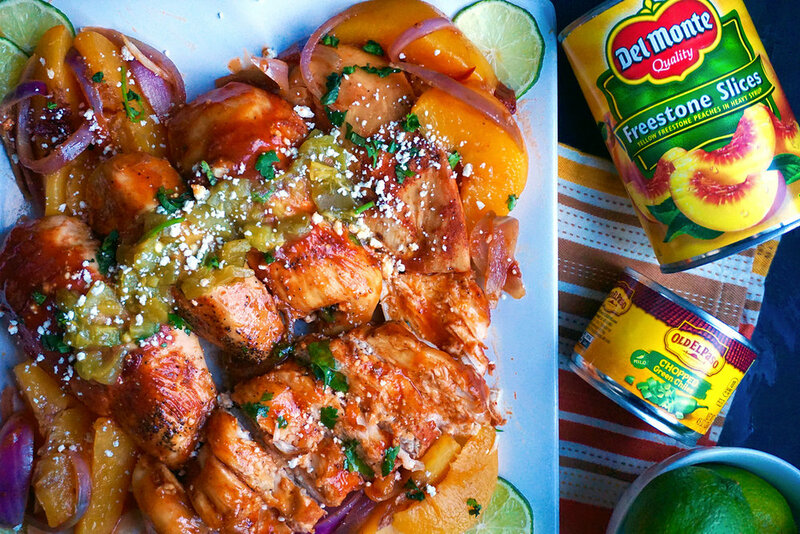 This Peach Chipotle Chicken dish is full of flavor with a kick. The chicken comes out juicy and then is glazed with a subtle spicy peach and chipotle glaze. Add some queso fresco, cilantro, and green chiles to the top with a squeeze of lime for a colorful dish. I always have ingredients like chiles in adobo, and green chilies in my “cantry.” Chiles in adobo can add an extra depth of flavor to stews or tomato based sauces. The chiles can add an extra flavor to salsas or fish marinades as well. Also, items like canned peaches or apricots are great for crockpot cooking. They break down and make delicious additions to bbq sauces or chicken dishes such as this one! And best of all, they're picked and packed at peak ripeness, and their nutrition is locked inside, so you can enjoy them year-round!" This post is done in partnership with the Cans Get You Cooking Campaign for #NationalCannedFoodMonth. All recipes and opinions are my own. Pat the chicken breast dry with paper towels. In a small bowl combine the salt, pepper, cumin, ground mustard, and smoked paprika. Sprinkle over the chicken breasts. In a large slow cooker or crockpot place the garlic and onions in the bottom. Then add the chicken breast on top. Place the drained peaches on top of the chicken in the crockpot. In a medium size bowl whisk together the cup of reserved canned peach juice, ketchup, honey, chopped chipotle peppers, chipotle pepper liquid, and salt until smooth.crockpot. Pour this over the chicken and cover. Set your slow cooker on low and cook for four hours. Once the chicken is cooked through removed from slow cooker and set aside. Strain the remaining liquid from the slow cooker or crockpot using a fine mesh sieve. Transfer the liquid to a medium size pot. Whisk together the cornstarch with a little bit of water before adding it to the pot (like a tablespoon or two of water should do). Add the cornstarch to the pot and stir to combine over low heat. 1. Transfer the chicken to a platter. Squeeze the juice of a half of a lime over top. Brush the glaze on to the pieces of chicken. Top with cilantro, green chilies, and queso fresco to serve.